Located near the Selva Misionera forest, Exe Hotel Cataratas provides intense contact with nature, great swimming pools and several other leisure options. A tennis court, games rooms, playground, sauna and gym are some of the hotel's facilities. Spa facilities including a heated pool are available at a fee. All of the comfortable guestrooms at Exe Hotel Cataratas feature air conditioning, a safety deposit box and a cable TV. They include a private bathroom with a bath tub, a hairdryer and free toiletries. The 5-star Exe Hotel Cataratas has also a bar and restaurant, where you will find a wide range of regional and international specialties. The large rooms and knowledgeable staff are other items that set the hotel apart. Please note that half board rates do not include beverages and meals are served in the dinner. Please note the based on local tax laws, all Argentinian citizens and resident foreigners must pay an additional fee (VAT) of 21%. Only foreigners who pay with a foreign credit card, debit card or via bank transfer are exempt from this 21% additional fee (VAT) in accommodations and breakfast when presenting a foreign passport or a foreign ID along with a supporting document handed by the national migrations authority, if applicable. Walking into the room the carpets are badly stained and as I look at the mattresses on the beds I know immediately that I am going to have a "back problem", and I was right. Bathroom had been updated and was workable. At the breakfast buffet the hot food was minimal and not very appetizing, so we focused on the cold food. Because of the breakfast buffet we never ate at the hotel but went into town for lunch and dinner. A salute to the hotel director who introduced himself. I have never met another hotel director. I think it is at most a 3 stars hotel although it ranked 5. Very old simple hotel.But the location is good. The hotel is located several kilometres from the town. It is spacious, reasonably clean etc. but with limited facilities. Desk staff failed to provide an arranged wake-up call. It is not a 5 star hotel by any strech of the imagination. I'm an avid traveler and while I like luxory, I usually travel modestly. I had spent 3 weeks staying in hostels and guest houses throughout all of Argentina and I thought I would splurge and stay in a nice hotel for my last two nights before heading home. Every other place I stayed at, the people were incredibly helpful and would book my activities and give me tips on the cheapest and easiest way to enjoy my time in their city, and these were hostels that cost $15/50/night USD. When I arrived they didn't even say hello, they just shoved the sign in information sheet in front of me, and when I said hello (I speak Spanish fluentely btw) he sarcastically said welcome. I told him I had 2 questions. One regarding the specifics on visiting the National Park, and he gave me the bare minumum of information and seemed annoyed that I had asked, and then went off to talk to a coworker. I reminded him that I had another question and he again seemed annoyed to have to deal with me. This was the attitude I received any time I spoke with the receptionist. I also had to pry information out of them to locate the bus stop to get to the National Park, and I overheard them telling 2 english speakers very vague directions, and I noticed they couldn't find the spot. They advertise wifi, but there is only wifi in the lobby and it doesn't reach the individual hotel rooms. I tried ordering dinner via room service and the line never worked both nights I was there. I wanted to get laundry done, but I couldn't find the price and when I called to ask how much, they refused to quote me a price. At 2300 the first night I was there, after I had locked the door and gone to bed, a random woman entered my room. The day I had to leave, I tried to schedule a shuttle to get to the airport and I had to ask and insist several times before they would let me schedule it. They kept trying to push the much more expensive taxi (100 pesos instead of 20). the hotel was as expected from previous reviews. the grounds of the hotel are lovely and our room had a view of the swimming pool, which was very nice. the breakfast, included in the price of the hotel, was good. we did not want to have the buffet in the evening so we ate in the snack bar. the food available was limited and not very good. it would have been nice to have a dinner menu to choose from, and to have better food. the bread on the sandwich was so hard i could not eat it, and the staff did not seem to care. the size of the room was more than adequate. the hotel needs to replace the worn carpeting. the door handle was loose and could have easily been repaired. it was very nice to be able to take the public bus to the falls each day. the staff told us where we could catch the bus. i would probably stay at this hotel again, if i returned to this area. it is a good value in spite of the limitations listed. Amazing pool, great prices, great food, great staff. This hotel is outstanding and includes a beautiful pool, gym, restaurant, and helpful staff. You do not need to leave the hotel, there is plenty to enjoy at this resort and the Agoda price is great. It is a short taxi ride into town or about a 20 minute walk. The hotel can arrange tours to all the local attractions. This was a really great hotel and I recommend it and would love to stay again. Restaurant and mini bar prices were great! this hotel has dragged itself out of the 70's and hasn't had any work since, and yes it needs it. it's also 10 minutes drive out of town. this isn't such a problem as the taxi fare is set and 20 pesos to/from town. the rooms are just passable, but for their rack rate i would normally expect a much higher standard. the one redeeming feature (albeit old) is that following a long day at the falls the pool was great to relax in. however, they charge you to use the jacuzzi, what!!! Buffet dinner not to all tastes. Comfortable hotel with nice rooms and good facilities (Pool, Health & Fitness facility, massage etc). Superb location for access to Iguassu Falls (Argentian side) and much cheaper than the "in the park" Sheraton. Comments on some sites from previous years re carpets in poor condition have been addressed. However staff not 5 star and some a little surly. Room bar not restocked. Food for dinner is limited and moderate, breakfast is OK. Falls site is only 10 minutes by bus from the hotel. The buses are regular and will stop at request. Hotel will arrange transport and guide if preffered. They will also arrange tour to the Brazilian sideb of the falls. However this canalso be done by local coaches from nearby Iguassu "City". Times of these must be checked. 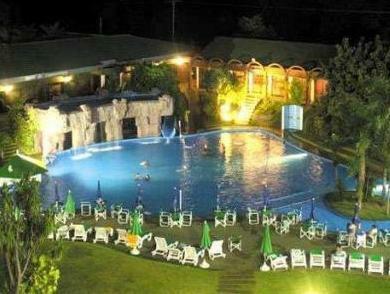 Pool, price, ease of use, spa, tennis court, staff very courteous and spoke perfect English. Good Service. I stayed at this hotel for a few nights whilst visiting iguazu falls and was nearly put off but the ridiculous comments / reviews on this website. For me I view the hotel as perfect if you want something not overpriced and more than adequate for a few days stop over at the falls, that feels safe, speaks English and reliable then this place is perfect. If you only stay in top class or its a special occassion with gf/wife whatever then go to grand casino or sheraton. Dont treat this as a beach resort hotel 5* you get in the USA or Vegas. In South America this is perfect on quality v cost. It is listed as a 5* hotel and whilst I agree it is not in comparison to the developed world standards, it is more than adequate and a pleasent hotel. I would class it as a low end 4* back in the UK thats not part of a chain. The pool was actually quite pleasent with waterfalls and a slide. Had an area around it for loungers and some music going. That being said I wouldnt of paid here due to trade off with Sheraton If you are looking for 5* quality then pay up and go to the sheraton or the grand casino. 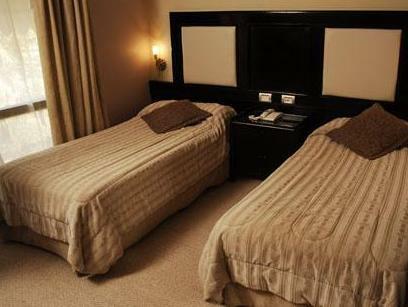 I had no problems with the rooms, they were clean and the beds were more than comfy to sleep in. The air con slightly noisy but ive had worse in 5*'s in USA! Yes the carpets are a little worn but not badly and certainly not stained. Sheets felt new and clean as did the towels. Breakfast was more than acceptable (again if you want a full buffet with everything under the sun go elsewhere) and the food for lunch/dinner was decent enough quality and priced fairly, no more than a standard restaurant in London. I have stayed at numerous world class top of the range hotels all around the world and I was more than happy here. good position between the falls, airport, and the city. 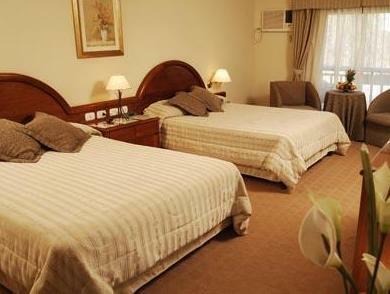 Very quiet place, large room and the king beds for both. Very nice garden and sport equipment. Staff was pleasant and helpful. I can recommend this hotel for everybody who want visit the Iguazu falls. Hotel staff is helpful, most of them speak good English, Rooms are in fair condition, but carpets are in poor shape and need replaced. Free internet service is available, but computer at hotel is an old one and in poor condition. 1-km walking trail, spa (great pedicure in my room), indoor pool and jacuzzi, cute kittens in pool area, taxi drivers. outdoor jacuzzi (cold), outdoor pool (lots of leaves and dead bugs floating around), mini golf (where are the clubs and balls??? ), game room (smelled like sweaty plastic), 50-year-old decor in rooms and halls, old-time keys instead of plastic keycard access to rooms. The grande dame is starting to show her wrinkles. Cataratas Hotel, km 4 of Rte 12 en route from Puerto Iguazu to Iguazu Falls, Argentina, was obviously the place to be 50 years ago, and perhaps even ten years ago, but now it is need of a facelift and modernization. That said, the food is good and the taxi driver we got ended up being THE number one great experience of our big South American vacation. If everybody got Silvio as a taxi driver, then everybody's favorite country would be Argentina. When we arrived last week, LAN went on strike and the reception desk had to deal with dozens of new folks showing up unannounced as they were all stuck in South America. The reception desk did a good job of dealing with the load. Breakfast was a pretty good buffet. Dinner was a delight - we had melt-in-your mouth steaks with mashed potatoes. Yum. I was surprised there was not a shuttle bus running constantly from the hotel to Iguazu Falls, but they called me a taxi, and thta changed my life as Silvio happily showed us into the park, showed us what to do for day one, made sure our tickets were stamped to get a half-price discount for day two, drove us to the Brazilian consulate to see if we could get Brazilian visas to see Iguazu Falls from the other side, and drove us to the airport. Without his enthusiastic help, this trip could have been a disaster (and we'd probably be in some Brazilian jail by now). God bless Silvio! Hotel lies on main road just outside Iguazu. It has a jungle style jogging route in the backyard, swimming pool, spa facility. Really friendly, helpful service; nice rooms, but it would hardly qualify as a 5 star hotel in either Europe or the USA. Prices are cheaper accordingly. Still one of the best places to stay around. Clean, large rooms, accomodating staff, plenty of sitting areas inside the hotel to relax. The hotel says 5 stars on the front but is not comparable to other 5 stars I've stayed at...but in Iguaza it would probably pass. We stayed a couple nights at the hotel on Sept 6 and 7 on 2009 and enjoyed our stay. The breakfast was quite good which offset how expensive dinner was. For dinner you could either choose a selection from the menu or pay for the buffet which was actually split into three different buffets (salads, main dishes, and deserts) making it a little easier to swallow the price if your not a desert person. If you chose all three it would have come to almost $80 pesos roughly. The only bad experience of the trip was the ride to the airport. We had the hotel call someone to pick us up from a bus company ($30 pesos) but we ended up taking a taxi ($80 pesos) because they said they couldn't find us at the hotel. That was even though I kept asking every driver coming in if they were looking for us. All in all, a good place to stay. I would probably consider a cheaper hotel considering the short stay, although if your willing to shell out a little more for some extra comfort it's a good choice. I had a reasonably pleasant stay here. I mean it wasn't the best hotel ever, but it wasn't bad either and for the price it was reasonable value for money. Granted, the hotel was by no means five star (as claimed), and access to the pool was by payment of 30 pesos only, but these were only small drawbacks. The staff was quite friendly and very helpful, especially helping me with my travel plans and lost debit card and cell phone charger. Es viejo y esta bastante sucio..